I'm So Confused! 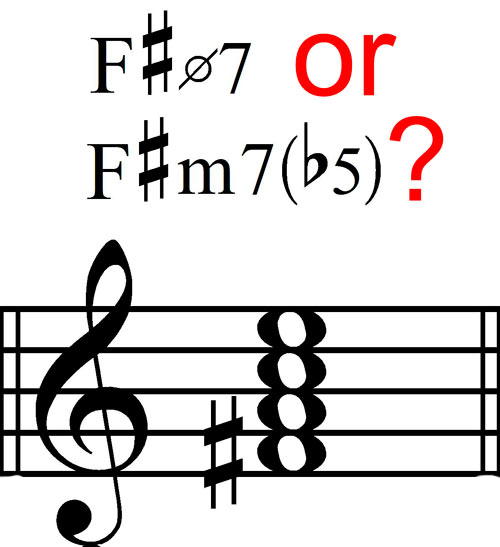 Am I a m7b5 Chord or a Ø7 Chord? The plain truth about how the same chord can have two different names: The story of the minor seventh flat-five/half-diminished seventh chord, what it is, how it is used, and how to play it on a guitar. METHOD ONE: Start with a diminished triad and add a minor seventh. This is called a half-diminished seventh chord. It is called a half-diminished seventh chord to differentiate it from a fully-diminished seventh chord, which is constructed differently. For the music theory aficionados in the peanut gallery, a half-diminished seventh chord contains a diminished triad and a minor seventh - only one diminished "thingy" - while a fully-diminished seventh chord contains a diminished triad AND a diminished seventh - TWO diminished "thingies". That, in a nutshell, is why we have half-diminished seventh chords and fully-diminished seventh chords. If your eyesight is becoming blurry at this point and you have a headache, we will reserve further elucidation of this complex subject for another time. ;-) Here are the two steps involved in method one of constructing this chord. 2. Add a minor seventh. A minor seventh is a note seven alphabetical letter names inclusive above the root pitch (F# in this example) and ten half steps: E.
We've just constructed an F# half-diminished seventh chord. Now we can join the Chord Constructors Union! METHOD TWO: Start with a minor triad, lower the fifth by one half-step (more about this later), and add a minor seventh. This is called a minor seventh flat-five chord. If you haven't figured out what's going on yet, you will in a minute. 1. Create a minor triad: Start with a root pitch, then add a second a note a minor third higher (three half steps), followed by a third note a major third higher (four half steps) than the second note. As we did above, the letter names must follow the rule that we use "every other letter name in alphabetical order". Example: F#, A, C# are the notes in an F# minor triad. 2. Lower the fifth by one half-step. You probably get the "lower by one half-step" part, right? But the "fifth" needs a little explanation. Oddly, but not inexplicably, the fifth of the chord is the third note from the bottom. Why? Because the third note from the bottom of a triad is also five letters names above the letter name root of the chord. Since we leave out every other letter name, while it's the third note, it's also the fifth letter name. (Do you get the feeling that Yogi Berra is actually writing this article, the man who's quoted as saying "When you get to the fork in the road, take it"?) In simple terms, it's called the "fifth" of the chord because it's five letter names above the root. Simple right? Scratching your head yet? To keep from wearing a hole in your head, you might try scratching in a different spot once in a while because music theory is full of strange and frustrating conundrums like this. Stop scratching just long enough to look at the following picture of a triad that's actually a minor flat-five chord, even though it's never called that. (Yogi again?) (Notice that the C#, the "fifth" of the F#m chord shown above, has been lowered one half-step to C.) It's always called a diminished triad, except when it's used as part of a minor seventh flat-five chord. (OK, I give you permission to scratch a totally different part of your head!) I think Yogi Berra wrote a lot of the music theory textbooks. 3. Add a minor seventh. A minor seventh is a note seven alphabetical letter names inclusive above the root pitch (F# in this example) and ten half steps: E.
We've just constructed an F# minor seventh flat-five chord. Now we can become the Grand Master of the Chord Constructors Union! That's Why It Has Two Names! Shown directly below are the results of the two methods of construction detailed above. Yes, your eyes are right! They are exactly the same chord! In the annals of music theory, there is little more confusing than having a single chord that has two different but equally valid names! It's like naming your son John and Paul. Huh? Who does that? Ready to be a card carrying member of the Music Theorists Union? Right about now I wish I had a magic wand that would instantly give you a whole year's worth of college music theory in your noggin. But, alas, I don't. So, if you find this next part confusing, you can either find that magic wand or bone up on a little music theory. But regardless of your knowledge of music theory, I hope I can make some sense, even though I'm going to assume you know a little somethin' 'bout the fine art of music theory. You might be thinking, "OK, that's all fine and dandy but what does it have to do with this split personality, double-named half-diminished/minor seventh flat-five chord? NOTE: From here on out we're going to refer to this chord by it's most common one, the one used by jazz musicians: minor seventh flat-five. Here's your answer: the minor seventh flat-five chord usually functions in one of two ways. It's either followed by the I or V chord in major keys, or the V chord in minor keys. (Music theorists love to show how smart they are by using antiquated number systems, like Roman numerals.) In Roman numeral terms, in major keys it's a vii followed by I or V). In minor keys it functions as a ii followed by V.
If you're bored by all of this theory talk and want to get to the practical nuts and bolts section, just skip down to where the chord diagrams are. But if you're into this cerebral stuff, let's close this section with a couple of jazz examples from specific keys. 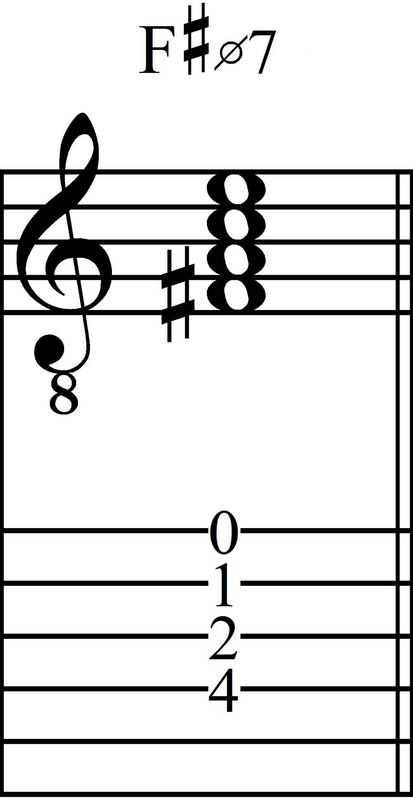 If you're in the key of C major, a minor seventh flat-five chord would usually be a Bm7b5 chord and it would often be followed by either C or G (with sevenths added, such as Cmaj7 or G7). 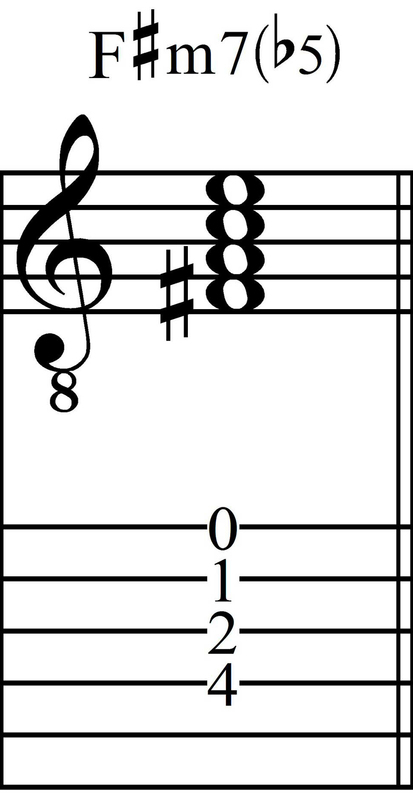 In a minor key, like C minor, the minor seventh flat-five chord would be Dm7b5 and it would usually be followed by G (usually G7 or one of it's substitutions such as G7b9). Please keep in mind that these are very simplified examples. In actual practice, it is much more complicated. After all, music is more art than science, right? Finally! Something you can use, right?! You bet! The minor seventh flat-five chord is found in four positions: root, 1st inversion, 2nd inversion, and 3rd inversion. Since the chord has four different letter names, we can place any one of them in the bass. Without getting into details, this is how we create one chord in root position and three in inversions. Many guitar players know these as slash chords, which are explained elsewhere in the learn section on my website. Shown below are various chord frames which give you lots of ways to play these darn two-timin' minor seventh flat-five/half-diminished seventh chords. I've also shown each chord shape in notes and tab, using F#m7b5 as an example. For a PDF version of the chord shapes, click here. I hope you have found this article helpful.